Kendal-based marketing and branding specialists Creative Lakes has launched a new name and brand for a maker of “indestructible” beds – for pets. The naming and brand development project designed by Creative Lakes has included the development of a new company name - Tuffer Stuff - new logo, website, marketing collateral and the launch of a new company Facebook page and Twitter account. Tuffer Stuff is a pet company that produces high quality, stylish pet beds for those customers who really want to spoil their cats and dogs. 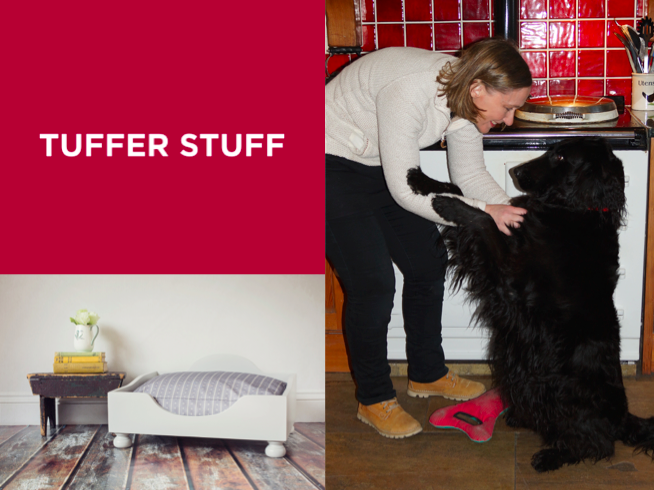 Tuffer Stuff beds are very durable and made from tough material, but at the same time are washable and extremely comfortable for the dogs and cats that enjoy them. They are designed and manufactured to last, and currently are all custom-made to order by the managing director of the company. Tailor made and personalised bed frames are also part of the current product range. The new Tuffer Stuff website is now live at www.tufferstuff.co.uk The new facebook page www.facebook.com/tufferstuff and twitter account is @tufferstuff and are also both now live.